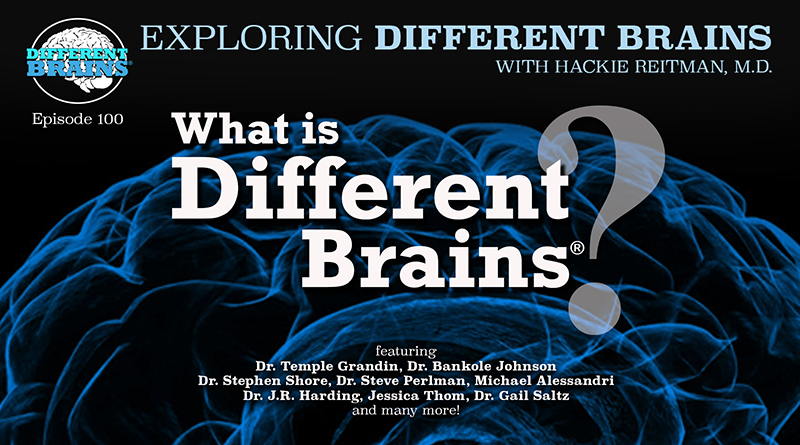 (21 mins) In this special 100th episode of Exploring Different Brains, Hackie Reitman, M.D. explains what Different Brains® stands for through the words of some of our amazing past guests. Featured in this episode are: Dr. Bankole A. Johnson (heads the Brain Science Research Consortium Unit (BSRCU) at the University of Maryland School of Medicine, and is one of the world’s leading authorities on the subject of addiction, and was featured on HBO’s addiction), Dr. Gail Salts (Clinical Associate Professor of Psychiatry at the New York Presbyterian Hospital Weill-Cornell Medical College, a psychoanalyst with the New York Psychoanalytic Institute, a columnist, bestselling author, podcast host and television commentator and one of the nation’s foremost go-to experts on a variety of psychological and mental health issues ), Dr. Stephen Shore (author, autism advocate, board member for Autism Speaks, and professor at Adelphi University), Jessica Thom (British advocate diagnosed with Tourette’s syndrome at the age of 20, and is the co-founder of Touretteshero, as well as an artist, play worker, fundraiser), Dr. Matthew Schneps (an astrophysicist and visiting scientist at M.I.T., and founder of the Laboratory for Visual Learning), Tom McGranahan (author and advocate for the awareness of epilepsy), David A. Grant (brain injury, the founder and publisher of TBI HOPE Magazine), Shawn Smith (neurodiversity advocate and consultant, and founder of Don’t Dis-my-Ability), Stacey Hoaglund (editor of The Autism Notebook Magazine, a Family Support Specialist for Family Network on Disabilities, the CEO of Disability Training and Support Specialists, project coordinator for Partners in Policy-making, author of “Go for the Goal: A Parent’s Guide to Creating Meaningful IEP Goals,” a tireless advocate for the neurodiverse, and the mother of a son with autism), Dr. Temple Grandin (prominent author and speaker on both autism and animal behavior, professor of Animal Science at Colorado State University), Michael Alessandri (Executive Director of the University of Miami-Nova Southeastern University Center for Autism and Related Disabilities [UM-NSU CARD] ), Dr. JR Harding (an author, disability advocate, and instructional specialist at Florida State University), Dr. Steve Ronik (CEO of Henderson Behavioral Health, the largest provider of health care support in South Florida, serving 30,000 people), Dr. Steve Perlman (Clinical professor of Pediatric Dentistry at The Boston University Goldman School of Dental Medicine, Co-founder and previous president of The American Academy of Developmental Medicine and Dentistry [AADMD], and was an integral part of bringing health care services to the Special Olympics), Denise Karp (autism advocate and founder of the yahoo autism parent’s group Denise’s List), and Sara Weir (President of the National Down Syndrome Society [NDSS], the leading human rights organization for all individuals with Down syndrome). For more information about our guests, click here! Hackie Reitman, M.D. : Hi I’m Dr. Hackie Reitman. 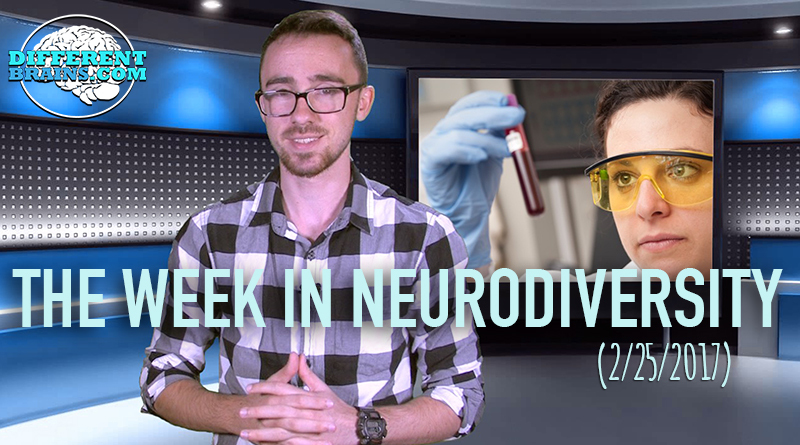 Welcome to the 100th episode of Exploring Different Brains–the interview show that advocates for neurodiversity. Since we started this interview show, we have had the honor of speaking with brilliant minds and international leaders from the world of neurodiversity. I’ve interviewed almost 100 of the world’s neurodiversity leaders, many of whom are neurodiverse themselves. So for this special episode, what we are going to do is we are going to show you in their own words some of these great people, what they had to say, about all of our brains being different, and all of the things that society needs to do to understand and embrace neurodiversity for the benefit of all of us. Different Brains Inc. is a 501c3 nonprofit, and I don’t think any of us here would be considered neurotypical. We’re a bunch of diverse individuals, making media, advocating for neurodiversity, and trying to get the world to understand that it cannot be one-size-fits-all. We believe that each of us deserves the opportunity to maximize potential for independence, for productivity, for health happiness, and safety. We are supporting all neurodiversity, all brains, from autism through Alzheimer’s, from addiction through pain syndrome, from dyslexia to Tourette’s syndrome, and any kind of neurodiversity you can think of. It affects all of us, and we all have to get together to make sure that each of us has the best chance to maximize our potential. So lets begin by hearing from some brilliant previous guests as they discuss and highlight the need for society to make sure that each of us has a shot at success. Bankole Johnson: Well you know one of the interesting things that we’ve learned in neurodiversity is and here is another myth that has come that I would love to dispel for you. That everybody’s brain is the same, everybody’s brain is not the same, it’s not even close. In fact part of the problem, we all process information slightly differently, we may all depending on our genetic makeup, develop signaling pathways and response to different types of sensations and there for everybody’s brain is not the same. That’s why the path for meds in the future is this aspect of personalized medicine because we finally realize that you can’t treat everyone the same and expect to get the same result and that treatments need to be individualized and we have very powerful tools at the present time for individualizing medical practice. The question is how long is it going to take us to educate all doctors to be able to do this. HR: In your definition of the “power of different,” tell me what that is from your point of view. Gail Saltz: Sure. It is the fact that there are certain differences that occur in the brain from a wiring perspective, I will say, that may cause one to be present with some symptoms; symptoms of depression, anxiety, difficulty concentrating, and maybe difficulty socially relating to others, maybe it’s even psychotic thinking, or maybe it is a learning disability of some sort. But those same differences are in wiring that may cause particular symptoms, often have a very strong correlation to wiring that also presents as a very particular strength, so, the potential for great ability or literally that great ability that often leads to extraordinary success and talent, and even in some instances, genius. HR: Like you said, focus on the positive. What do you like and connect at that point? Dr. Stephen Shore: Right. And what it is, is it’s a matter of transitioning from, what I call, the deficit model of autism, you know, so much focus on what can’t be done, towards an ability-spaced model, so we need to really be asking the question, what can that person with autism do? And then work from there. Jessica Thom: I’m a big fan of the way of thinking about disability called the social model of disability. Biscuit. And the social model of disability has had such a big impact on me, because it understands people aren’t disabled by their impairments. It’s normal to have bodies and minds that work differently. People are disabled by environments and attitudes and systems that don’t consider difference in how they’re set up. But the really exciting thing about that is that just by thinking about difference and thinking about different types of people, we can create less disabling spaces. Biscuit. Hedgehog. biscuit. Dr. Matthew Schneps: If you have something that’s different about your brain, it doesn’t mean that you’re not a productive citizen, that you can’t make important contributions, and furthermore, that in many cases, the unusual perspective you bring can open up new ways of thinking that’s very valuable to society. So the fact that our brains are different makes it possible for us to do things that other people can’t because they don’t have our perspective, they don’t have our skills, they don’t have our ways of thinking, and I’m trying to get that message as broadly as I can. So a large time of my day is spend doing writing, talking to people like you, whatever, anything I can. HR: An important part of maximizing potential is receiving support, be it from organizations or from loved ones. That’s true for all of us. None of us can do it alone. Let’s hear from some of our previous guests on the importance of support. Tom McGranahan: So when you have epilepsy, like with all kinds of other ailments, you realize you take different steps. You have to look at things in different ways to get your journey accomplished. But that doesn’t mean you stop your journey, it means you just change it. You just look into it more about what’s necessary, what step’s best to go ahead with things. And that’s why it’s so good having family and others. And by the way, I blame my wife. I told everybody, if it wasn’t for her I’d be dead by now. I wouldn’t have been paying my taxes, wouldn’t be brushing my teeth, I wouldn’t have to do any of that stuff. But it’s a good problem to have. A lot of people with disabilities is the love and care of others that helps us through the times. And then when they see us standing strong, it helps them to stay strong. So it works both ways. It works both ways between each of us. David Grant: Most brain injury survivors lose 80% of their friends in the first year.” Which was our case. People that we’re close to socially new that I was different and human nature is what it is. When things are different, you back away from that of which you don’t understand. But the book goes on to say, “Don’t worry, because the void that was left with those that have left your life will soon become filled with others.” And I look at people who are apart of my inner circle now. And they are the most cherished relationships I’ve ever had. They’re more meaningful, they’re not superficial. And if I sense superficiality, I mentioned in one of my points earlier about surround people with those that have your best interest in heart. If it’s superficial, life is fast. It goes back quickly. And I choose to spend time with those that I cherish. Complicated, not an easy answer, or complicated stuff. But it’s common. I’m not unique in this. Shawn Smith: A lot of parents come to me and they think, I’m going to work with their kids. And probably 95% of the time I work with the parents. The kid is awesome; it’s the world in which we live in and how things are framed. So an example would be, a parent would come to me and say, my kid is isolating and spending a lot of time watching TV or on their electronics. So I reframe that for them, if 90% of your day consisted of being told what your doing is wrong would you want to spend time with you? Stacey Hoaglund: Well, quality of life is something that everybody wants. No matter if you have a disability or you don’t. And if you spend day after day being beaten over the head where your weaknesses are, how would you possibly have a quality of life? So by looking at where a person’s strengths are, and helping guide them down that path is so much more effective. Dr. Temple Grandin: My mother had a really good sense of just how much to stretch me slightly outside my comfort zone so I’d keep learning and doing new things. It was her idea to have me go out to my aunt’s ranch and after I’d done my aunt’s ranch for two summers she said, “well lets do something else and we’ll do the aunt’s ranch for half the summer and we’ll do an internship at a research lab for the other half of the summer.” Also, I was an aid for a child with autism, another half of the summer. Always stretching, she never threw me into the deep end of the pool, but always stretching and doing new things. I was hostess at her parties with I was 7, 8 years old. She got me a sewing job when I was 13 years old, and when I went away to my boarding school I ran the horse barn, cleaning stalls everyday, putting the horses in and out, feeding the horses. And now, when I look back on it, riding the horses was really fun, but actually the most important thing for my development was running the horse barn and learning how to work. Michael Alessandri: At the end of the day, what I’ve learned over the last 20 years since I’ve been here in South Florida is that it’s always got to be about the client. It’s always got to be at the end of the day about the person who is living with Autism or with any disability and the family that surrounds them. If you lose focus on that then you really lost the plot completely. Our role as professionals is to facilitate what the individuals with Autism and related disabilities want for themselves and want for the community in which they live. If we get in the way of that then we haven’t done anyone any good. So we really need to listen more. We do a lot of talking, those of us who are professionals and I think sometimes we need to step back, silence ourselves and really listen. And not just listen to words but listen to actions and movements and behavior. Listen carefully to what the community is telling us that it needs. JR Harding: …it relates back to the blog that I wrote for you guys which is having the courage to ask for help or the courage to self identify, the courage to express what your accommodation needs are and that means understanding who you are, what you are good at and the tools you need to do the job whatever that job might be and that took me a little while Hackie. It did, it took me a little while to be ok with knocking on your door and say “You know, hey professor so and so, I need some guidance here or i need some tutoring here, or where do I get this vehicle, who makes the starship enterprise, or who does modifications, or my door room needs this, or my workplace: I need this tool” and I was part of… when I was hired here, the first thing they asked me was: “what accommodations do you need to excel?” I needed to be able to do that and have comfort and confidence in asking what tools I needed to excel here at this position as a faculty member and the leader in the University change model here” and so going back to other folks, they need to not to be afraid, because you know what, the person on the other side is more afraid than you are, because they have absolutely no idea where to come from, and you need to guide them down the path together. HR: At Different Brains, we believe that everyone benefits through collaboration. We want to encourage organizations, individuals, to collaborate, get together, share things. Don’t be off in separate silos and don’t be fighting with each other. One organization that offers a good example of the value of collaboration is Nova Southeaster University TRED program. Lets hear from its founder Dr. Tom Temple about their philosophy. Tom Temple: So, this is really a Magnus opus, George Handers’ vision of basically creating research infrastructure that not only produces great ideas, but harnesses those ideas in a meaningful way. The work we are doing is really trans disciplinary, innovative, and focused on things that we do well. And looking at the prescient diseases of our time. HR: While we can all agree on the value of support and collaboration, to truly achieve all of these goals, we gotta get rid of the stigma that’s involved If somebody has a different brain, it’s much more stigmatizing We want to get rid of that. So we’ve been fortunate enough to highlight several organizations and individuals who are making great strides, at battling stigma. It is something we at Different Brains hope to work towards with every piece of content. We have been fortunate enough to highlight several organizations and individuals who are making great strides at battling stigma. Lets hear from just a few of them. HR: When we talk about entities such as Asperger’s and autism, I make the analogy that it’s kind of like being gay 50 years ago–you want to stay in the closet, you know? And we graduated, last year, three Aspie interns and they’re all doing great, they’re all in college and not one of them is going to ask for the accommodations that would make their life so much easier because they don’t wanna get stigmatized, and it’s a shame. Dr. Steven Ronik: Yeah, well, what happens is, you know, what recovery is about, where you get to the point, you see, you should–it is a shame. People shouldn’t be ashamed that they have any condition–Asperger’s included, especially. Any autism spectrum-related disorder. First of all, they’re super common, right? Just like mental health conditions are super common; 1 in 5 Americans at any given time has a mental health condition. So that is a shame. And folks sometimes do need accommodations, and they should get accommodations, and hopefully, over time, there will be less stigma around that. To us, the ideal is to get them to where their condition is incidental–where it doesn’t define them. Right? They might happen to have diabetes, they might happen to have Asperger’s, they might happen to have schizophrenia, whatever it might be–right, you don’t want them to be defined by their condition, it’s something they have, its incidental to who they are as a person. Not the defining feature, not that they don’t accept that they have it, but people have a life beyond what their condition is. Not to be completely identified by your condition and when you are identified by your condition, and people call folks, diabetics, or schizophrenics–even how we use language can matter sometimes. You’re defining people by their condition, and that’s not good for that–or for anybody. Dr. Steve Perlman: One of the I think biggest messages that we can convey is that this population doesn’t need pity. Special Olympics has been credited with bringing people with intellectual disabilities from out the shadows of neglect and into the mainstream of life, but more important to show the world what they can do rather than what they can’t do. Denise Karp: The best thing that you guys can do really is to bring everything out in the open and get it out there and talk about it and even if you don’t have any answers, just keep asking the questions. I mean that’s the most important thing. The autism awareness and all that. I know a lot of people looked at autism awareness month, so you know, it’s just a Public Relations thing. I don’t believe that for a moment. It is very important that people know how many people have autism, are autistic and it does affect everyone. Get the word out. Sara Weir: We felt that it was very important to put a stake in the ground that individuals with down syndrome have all of the potential in the world to achieve their own hopes dreams and aspirations but for the only thing that holds the back are archaic outdated laws and as an organization, we want to change those laws to empower individuals with down syndrome to live long healthy lives, speak out inclusive educational opportunities, seek out full and competitive employment and when I say employment, I’m not just talking about a job, I’m talking about a career and of course be a meaningful contributing part of society and be integrated into the community in a very competitive way so we’re very proud of our mission and we have an amazing team behind this organization that’s fighting for the rights of people with down syndrome each and every day. HR: When it comes down to it what differentbrains.org stands for, it’s for ending this idea of “One size fits all.” When we end stigma and work together to help those of us with different brains to achieve maximum potential, we have truly reached a point where society understands and embraces neurodiversity for the benefit of all of us. So, lets end this episode by hearing from the brilliant Dr. Stephen Shore one more time. From the entire Different Brains team, thank you for watching and being a part of our growing community! Stephen Shore: I think we need to consider if we an autistic person is fulfilled and productive with their life then that’s a success. For some of us it might be serving as a University professor, for others it might be at Microsoft, for others it might be working at a carwash, for others it might be fixing lawn mower engines. Whatever it is, if we get that match between interest and skill and ability, whereever it is, then we have the recipe for a fulfilling and productive life. I think that’s universal, it works for everybody whether you’re on the autism spectrum or not. In this episode, Harold Reitman, M.D. 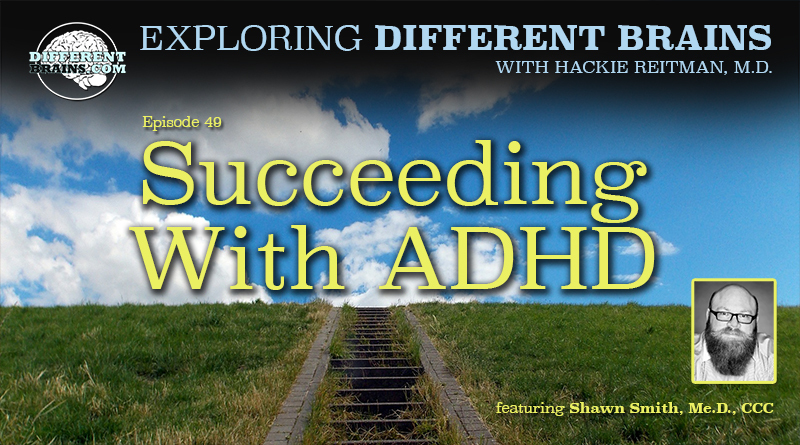 speaks with returning guest Shawn Smith, of Don’t dis-my-ability. (4min 12sec) In this episode, Lena Dunham demonstrates yoga poses to help with anxiety, an Australian man with autism starts his own business, and a blood test may lead to treating depression! These stories and more in this week’s edition. Harold Reitman, M.D. speaks with Lori Butts, J.D., Ph.D. and discusses the importance of focusing on symptoms, not labels, when treating the neurodiverse.